Flat panel monitors should be the norm everywhere these days. The old, clunky, bulky cathode-ray tube monitors take up unnecessary space and waste a lot of energy. Flat panel LCD monitors look better, put less strain on the eyes, and carry appealing price tags these days. Most LCD flat panels come attached to some sort of functional stand. Those stands are nice, but I prefer to put my monitor on a desktop-attached “arm” that gives me more flexibility in tilting, moving, and/or rotating my monitor. 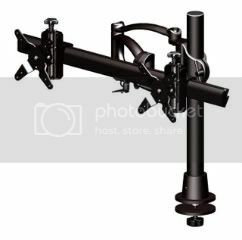 Most popular monitor stands clamp on to the edge of a desk and have a swinging arm that holds the monitor. Most of the built-in stands on LCD monitors are easily removed, which always reveals four screws in a square. The distance between those screws conforms to an industry standard so that it can be easily attached to another stand or arm. One company putting an interesting spin on the monitor stand market is the Ergotech Group Inc. with their “convertible” monitor arm. Ergotech’s convertible arm is designed to hold a single monitor just fine, but when you screw on the included 25 inch metal bar, the arm holds two monitors. I was very impressed with the quality of Ergotech’s convertible monitor arm. Just lifting the shipping box, you know there’s some solid metal inside. And when you pull the arm out of the box, you are immediately confident that this product will hold two monitors without a problem. The Ergotech convertible arm evens looks cool. The arm doesn’t swivel and swing around like many other monitor arms do. Instead, it’s firmly clamped to the edge of your desk and two oval metal supports extend off a 16 inch metal rod. The monitor supports can be raised or lowered as necessary. The other end of the support arm holds the monitor. After you remove the monitor stand that came attached to your LCD monitor, you’ll need to attach a metal plate (included) to the back of the monitor with four screws. Once the plate is secured, you simply lift up your LCD monitor and clamp it on to the end of the support arm until you hear a click. That click is the “quick release” mechanism latching into place. If you need to unhook your monitor from the stand, it’s a simple matter of pulling upon on the quick release pin and pulling off the monitor. Next I wanted to try two monitors. Some folks still think I’m extravagant in that I use two monitors all the time. Today, we all do increasingly more work on our computers, so why not give yourself more room to spread out so you can be more productive. No one uses a TV tray as a desk, so why do so many people try to fit all their computer work into a 15 inch monitor? Two monitors allow you to work on a Microsoft Word document on one screen, while you have Outlook open on the other. It may sound silly, but being able to glance over to see what just popped into your Inbox saves you two seconds that really starts adding up over the course of a day. There are numerous examples of studies declaring the productivity enhancements in using two monitors. In a law practice, having two monitors is essential. 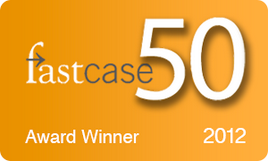 Everyone involved in law works with documents every day, and most people detest reading a document on a screen. I firmly believe that one reason is because we only see the top or bottom half a document at any one time. That’s NOT how our brains work. We like being able to see the entire document which is why so many of us go for the Print button when we need to do some serious reading. I turn one of my monitors on its side. Instead of having two monitors in “landscape” mode, I turn one to be in “portrait” mode. When you put Microsoft Word on that portrait mode monitor, you can expand your document so that you can see a FULL PAGE and not just a half a page. Again, it may sound silly, but I guarantee that you will enjoy working at your computer a little more. If you or your firm does any document review for litigation, having one monitor in portrait mode is an invaluable time saver for quickly reading through documents. The Ergotech convertible monitor arm allows you to do all this wonderfully. After I screwed on the convertible bar, I hung a 20 inch LCD monitor on the left side of the bar in the traditional, landscape mode; and then I hung a 19 inch monitor on the right side of the bar in portrait mode. The monitor plates allow you to freely rotate the monitors. The convertible arm allows you to move the monitors back and forth so you can achieve the perfect distance. The quality and strength of the Ergotech convertible arm is very impressive, and I was thrilled to see the convertible bar not show any stress when I put both monitors on it. The only “feature” that looked out of place on the Ergotech convertible arm were the two plastic hooks that hung under the support arm to hold cables. There was probably no other way to comfortably hold the cables, but they just looked a little cheap compared to the rest of the high-end unit. The Ergotech convertible arm is a little on the pricey side starting at $335, but you’re paying for the quality. Trust me, I’ve tried to some cheap monitor arms in the past, and you get what you pay for – many of them can’t hold the weight properly and they end up breaking within a short time. How do you search for Wi-Fi hotspots? 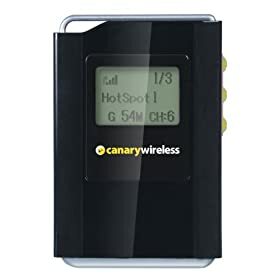 You can save yourself all that trouble by investing in a Digital Hotspotter from Canary Wireless which will tell you in a matter of seconds if it’s worth reaching for your laptop at all. I wrote about the first generation of the Digital Hotspotter 3 years ago. 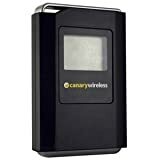 Back then, there were a handful of other Wi-Fi “finders” on the market, but the Canary Wireless model was the only one that actually told you some helpful information about the hotspot that it found – the others just told you it found a signal. The second generation (officially the HS20 model) boasts several improvements. First, it’s more streamlined than its older brother. Where the HS10 model was a tad bulky around the edges, the HS20 now measures a slimmer 3.19″ x 2.13″ x 0.65″. Still not tiny, but now slim enough so that it easily slips into a pocket, and it only weighs 2.5oz. The newer model also now detects 802.11n networks. That means you can now search for 802.11b, g, and n hotspots. The screen is also bigger, which allows room for a more information. And the screen is really the biggest selling point of the Canary Wireless Digital Hotspotter. While other Wi-Fi finders will alert you to the presence of a hotspot and will usually tell you the strength of the signal with a row of LED lights, the Digital Hotspotter screen will tell you the name (SSID) of the wireless network, the signal strength, the type of the network (b, g, or n), the channel number, and whether the wireless network is open (no password required) or secured (password required). Another major feature of the Digital Hotspotter is that it will detect multiple wireless networks. When you click the Hotspotter for the initial scan, it will tell you in the upper right corner how many networks it found. You can use the up/down buttons on the right side of the unit to scroll through each network. That means that if your first network requires a password, you can click through to see if there is another open network available. 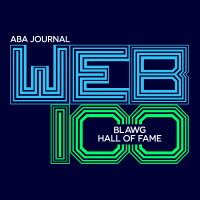 The Digital Hotspotter requires two AAA batteries. The bad news is that there is no rechargeable option. The good news is that you can always replace the batteries without requiring a proprietary charging cable. The Digital Hotspotter turns itself off after 30 seconds of idle time to conserve battery power. The Canary Wireless Digital Hotspotter is one of the required gadgets in my travel bag. When I’m stuck in an airport and need to check e-mail, I always whip out the Hotspotter first to see what networks are available. I usually find one or two secured networks, but I can keep clicking through the networks until I find a good, strong, free wireless signal. Only then do I go through the trouble of digging out my laptop knowing that I can immediately connect to the open network and get my work done. The Digital Hotspotter costs $59.95, but that is money well spent for all the times you’ll use this device to save the aggravation of opening your laptop and not finding an accessible Wi-Fi hotspot.